Standiford Family: Will that get clean? I opened the dishwasher earlier to put a few dirty dishes in. On the bottom rack I found this. Do you think this will really come clean? I don't. (Our dishwasher is good but I don't think it's that good.) I talked to the person who put it in there. She thought it would. 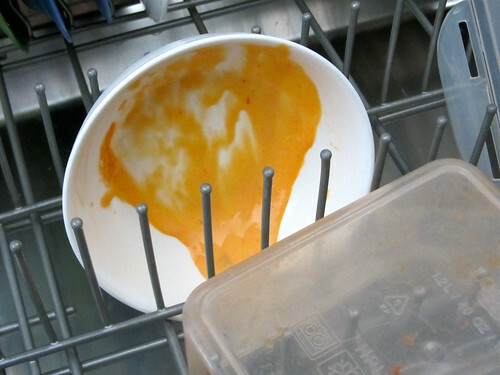 To avoid frustration when I empty the clean dishes I decided to just rinse it out some before running the dishwasher.